In the early 1970’s Seiko produced a number of singles featuring tracks containing references to the brand. I recently found this record Correct Time With Seiko from 1974. This is the third promotional record I have found with the previous examples being Rah! Rah! Seiko and Color Lively Seiko. The Correct Time With Seiko record has three tracks. The first is the title track performed by Naomi Sata and was composed by Asei Kobayashi who has been involved with the previous Seiko releases. The lyrics for the track were written by Ito Akira and they describe ensuring that your watch is set correctly, checking the time and date and making sure it is fully wound and cleaned. The second track is named I wonder if it is the hands of the clock and was also composed by Asei Kobayashi with the lyrics again by Ito Akira. This track is performed by Nokoinoko. 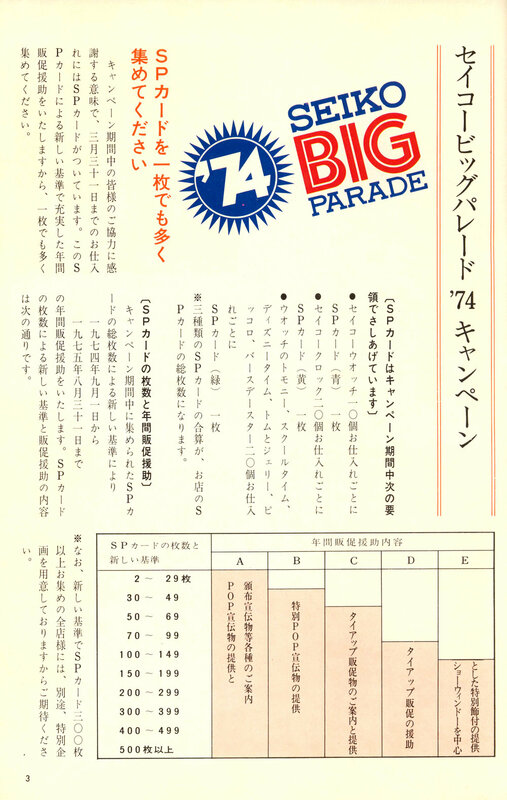 On side B of the record is the final track Seiko Big Parade ‘74. It was composed by Asei Kobayashi with lyrics by Yū Aku. The track is performed by Naomi Sata and Young 101. 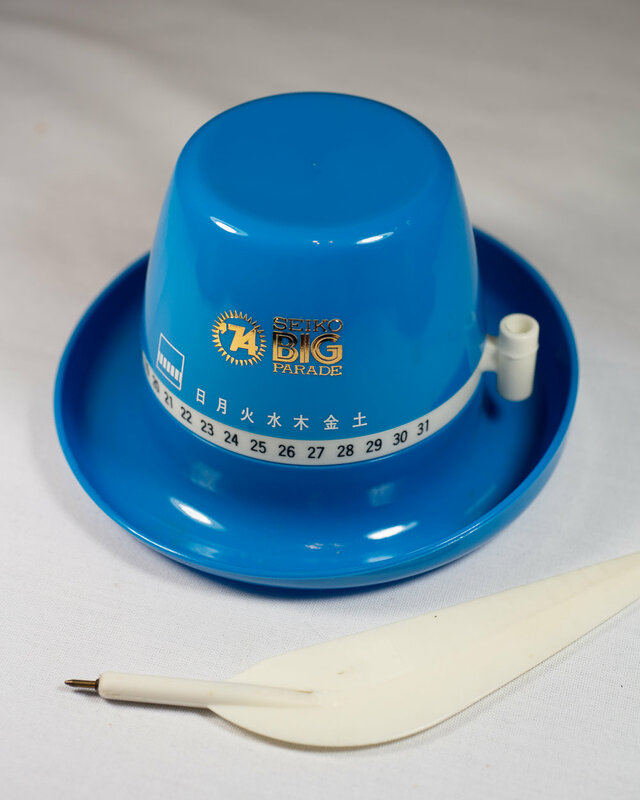 The Seiko Big Parade was a promotional campaign that was used at a retail level to promote Seiko watches. The campaign ran from September 1974 to August 1975. The campaign is outlined in the Seiko sales issue #187, January 1974. 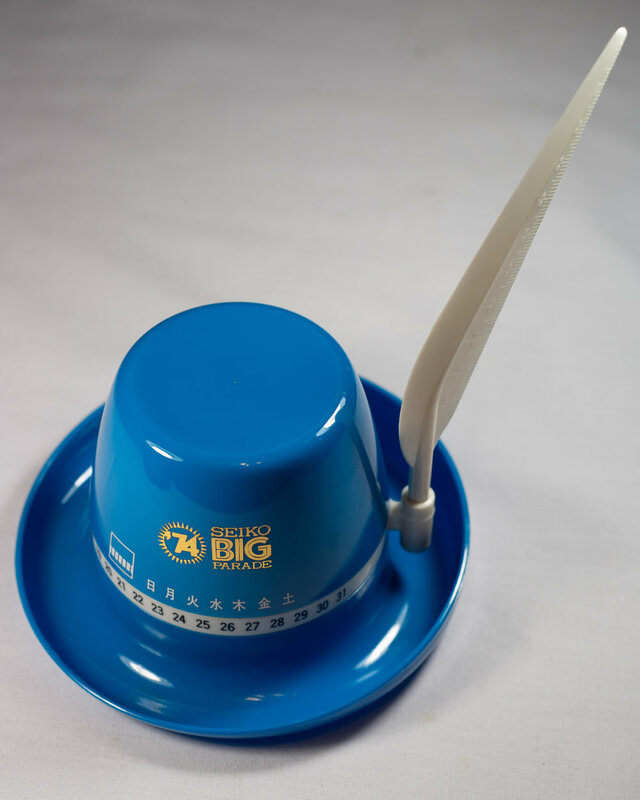 I have a promotional gift item from the campaign that consists of a desk stationary set designed like a hat. This allows items to be stored within the unit and has a stylised feather pen included. The campaign also utilized the tracks on this album, a reference to the first track can be seen on the advert below where it notes Correct Time with Seiko Let’s check the clock on Monday morning. The cover of the record features two Seiko watches. These are the men’s 56KAW 344 King Seiko Vanac and the ladies 27MLW S414 Seiko Joyful model, both models can be seen in the 1974 Volume 1 catalog.. 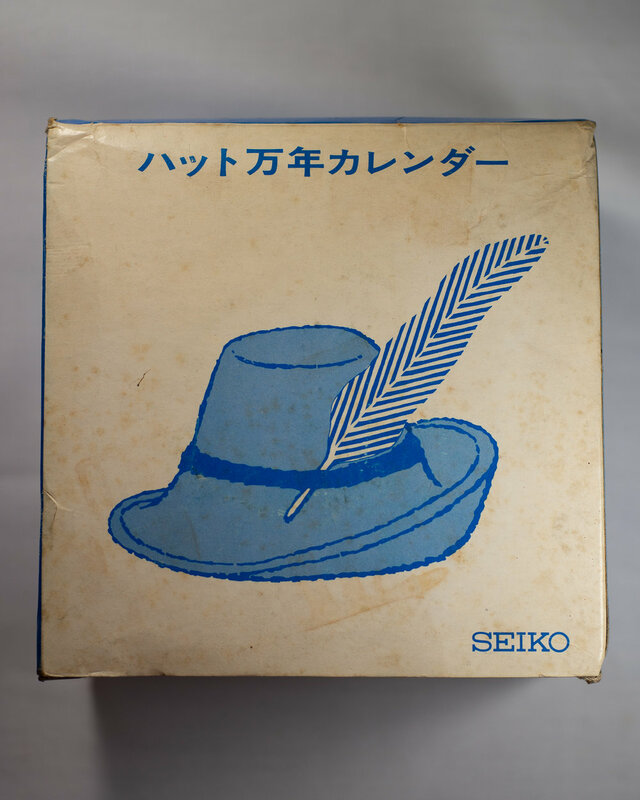 There is a Seiko logo on the rear cover as well as the logo used for the ‘74 Seiko Big Parade campaign. The record is marked as being released by Seiko Hattori Watch Shop, being not for sale but a promotional item and produced by Shiba Productions Ltd. The rear of the sleeve also has the lyrics for both tracks and the artists details as shown below.